Do you remember the lonely goatherd song from "The Sound of Music"? Marionettes are something typical for Italy and Central Europe and as a proper Baroque place deserves it, Salzburg has a great tradition in playing with dolls on strings. This is best watched in action at the Marionettentheater. You will also find a museum dedicated entirely to the world of Marionettes in general and the ones from the Salzburg marionette theatre in particular in the "Fürstenkeller" ("Prince′s basement") of the Hohensalzburg Fortress. 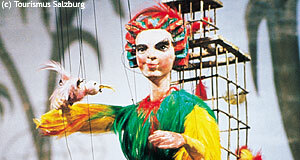 The collection includes famous marionettes from local productions of the "Zauberflöte" ("The Magic Flute"), but also a collection of dolls and marionettes from all around the World. Clearly, this museum is not among the top-notch highlights of Salzburg, but especially if you miss out on the marionette theatre itself, you might want to go to the Marionettenmuseum to compensate.